Bain has been charged with the task of identifying Moyes' successor following his resignation in the wake of the club's relegation from the Premier League and has enlisted former Scotland and Rangers boss Walter Smith as an advisor. Aberdeen boss Derek McInnes is understood to head a shortlist of candidates and while the Black Cats are keen to make an appointment as quickly as possible, they are determined to get the right man for the job. 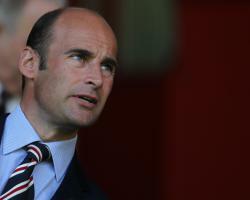 Bain told the club's official website, www.safc.com: "The recruitment process is ongoing. "Pre-season is an important period at any football club so naturally we are keen to conclude things as quickly as possible, whilst being mindful of the need to make the right appointment." In the absence of a manager, Sunderland have already drawn up a pre-season programme - that process was already under way while Moyes remained at the helm. The players will return for fitness testing on June 29 ahead of a five-day training camp in Austria and will travel to Gigg Lane to face Bury in a friendly in July 7. A series of domestic fixtures, including one to mark the 20th anniversary of the club's move to the Stadium of Light, is also being planned ahead of the start of the new Sky Bet Championship campaign.